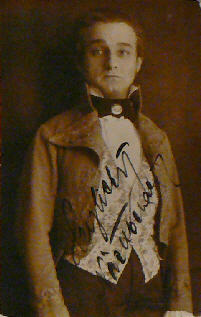 The operetta singer, librettist and actor Robert Nästelberger was primarily well-known for his singing talents. But he was also able to play to the gallery as an actor in some silent movies. To this movies belong "Seine Schwiegermutter" with Mitzi Griebl, "Der glitzernde Fluch" (21) with Alfred Neugebauer, "Die Nacht der Mary Murton" (21) with the legendary Anita Berber and Marion Illing as well as "Parema - Das Wesen aus der Sternenwelt" (22) with Carmen Cartellieri, Victor Kutschera and Carl Goetz. After a longer interruption he made his cinematical comeback at the beginning of the 30s and he took part in the productions "Trara um Liebe" (31) directed by Richard Eichberg with Martha Eggerth, Maria Paudler, Georg Alexander, Felix Bressart and Anton Pointner and "Holzapfel weiss alles" (32) directed by Victor Janson with Felix Bressart, Ivan Petrovich, Gretl Theimer, Theodor Loos, Anton Pointner, Julius Falkenstein and Paul Morgan. Robert Nästelberger died in 1942 at the age of only 56.